SuperFogeys - Hey Ho Let’s Go! Greetings, once again, SuperFans! Marc here with another illustration to share. This time it’s not superhero or comic book related, though so I hope you’ll enjoy it. 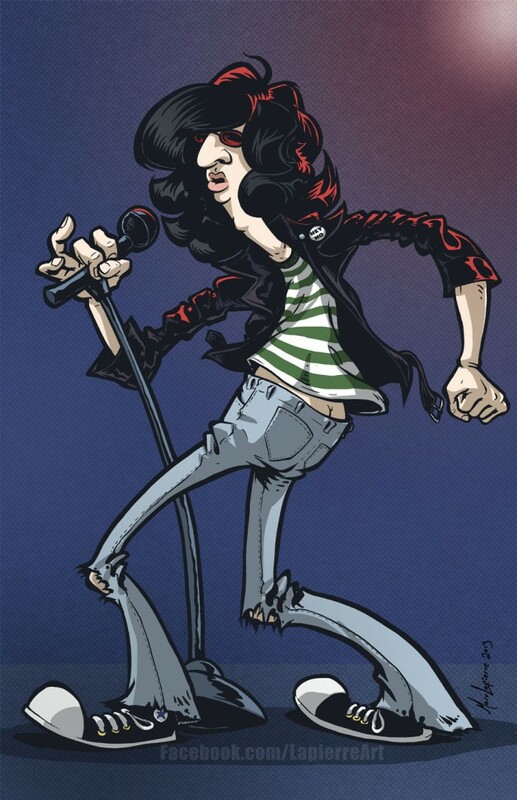 The other day I thought it would be fun to draw one of the most iconic performers of the 1970′s punk scene, Joey Ramone. Here's a pic I snapped of the blue line roughs I sketched out for this piece. After sketching Joey out in a Seuss-esque style with a light blue colored pencil, I then inked over it on a sheet of marker paper taped over the original sketch. For the inking, I wanted the look to be bolder than what I normally do, so I opted to use a black Prismacolor marker with a nice fat brush tip for all the heavy lifting. 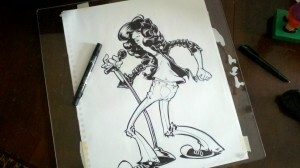 I then went back and cleaned up some of the line work with a Pigma Micron pen. 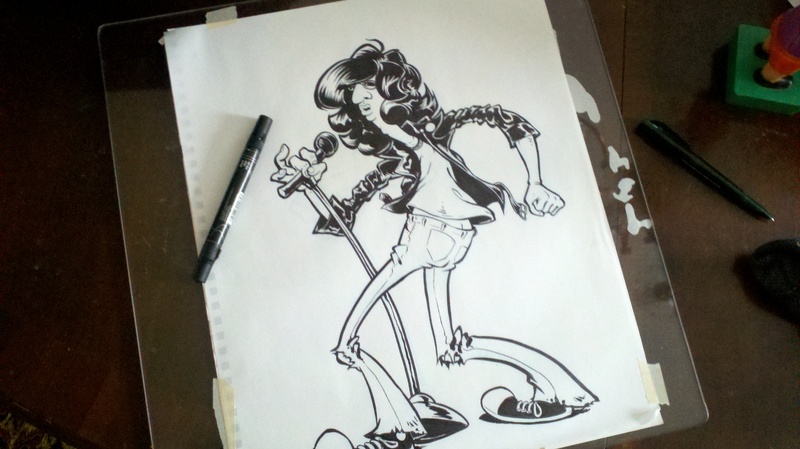 The original actually measures 14″ x 17″, much bigger than I normally draw at. After scanning, I colored in my usual fashion in Photoshop. When I color, I usually create a solid color layer for each major color in the piece, then create a layer mask based on a selection of the area I want colored. This allows me to easily adjust the colors if I need to after it’s all colored in without any hassle. For instance, I originally had Joey’s hair set as a darker shade of grey, but after laying in the background color, it didn’t “pop” like I wanted, so with a quick adjustment I was able to play with it and get it just right. The background also has a subtle grainy layer over it to give it some texture. This was created by making some quick gradients then playing with some noise, half tone screen, and blur filters. So, there you have it. 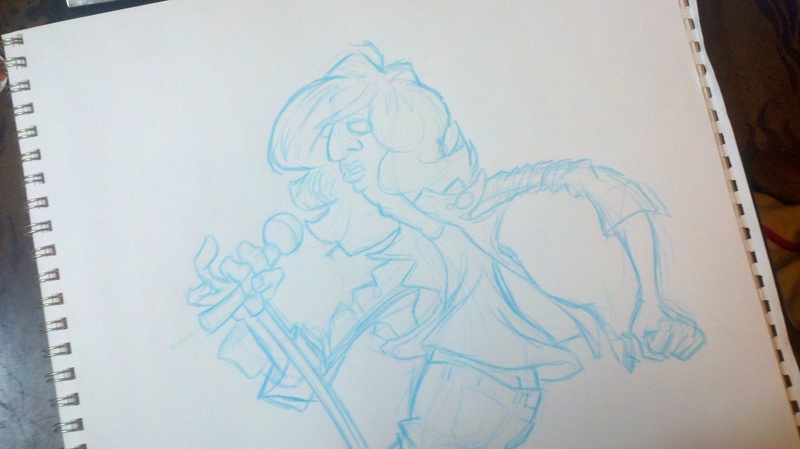 I hope you didn’t mind a little insight into my process. Let me know what you think and if you’d like to see more postings like this one. Sep 26, 2011 FAN ART: The Thrice Evil by Margaret Racine! Marc this piece is incredible. And I have to say, the rim lighting on the hair was the first thing that grabbed my attention. The coloring really just brings this home. Nice, nice work. Could easily be a print sold to Ramones fans. I LOVE THIS Marc! Terrific job! Man. I hope to one day pencil and ink like that. Among the things I haven’t yet learned or gotten down quite right, is things like what you did to the hair during the inking stage. I think it represents shine. But I haven’t quite got down where to put it yet. Exactly. Perspective, horizons, etc, may be another bad area for me. Gabba gabba hey! Great job!